In uncertain times, U.S. mining provides essential elements for safeguarding our nation. Despite being home to one of the world’s leading minerals reserves, cumbersome permitting processes contribute to the U.S. remaining import-dependent for 50 key metals and minerals –100 percent import-dependent for 20 of those. Import reliance subjects our supply chains to geopolitical instability and supply disruption. Our Armed Forces rely on domestic metals and minerals for sophisticated weapons systems and safe transport of our troops. Our abundant supplies of metals and minerals minimize our reliance on foreign countries for these vital resources used in tanks, aircraft carriers, jets and submarines. For example, beryllium is used to reduce weight and improve guidance performance in fighter jets and NASA technologies such as the mirrors on the James Webb Space Telescope. 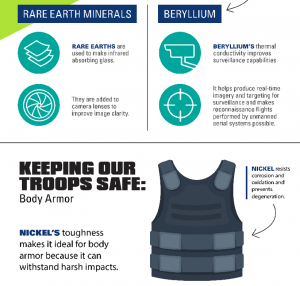 And metals such as copper, lead and nickel are used in military gear, weapons systems and other defense technologies. America’s security depends on our ability to access and utilize the domestic energy and minerals resources that are abundant in the U.S.